Pictured: detail from Inner Mystery | 2018 | oil on canvas | 30x30 inches | $1600. 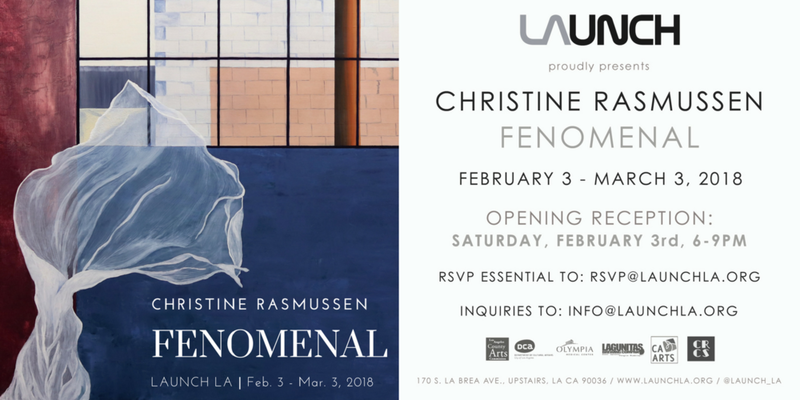 LAUNCH LA proudly presents CHRISTINE RASMUSSEN: FENOMENAL. View the exhibition. My series FENOMENAL is about femininity as a force of nature—fearless, unfettered and unapologetic. Vibrant and dynamic disembodied garments hover and flow through austere urban landscapes where walls and fences constrain while windows and doors hint at opportunity. The spirited cloth shapes transcend all. Indeed, my exploration of femininity arises from my upbringing in three different countries. Inspired by Maya Angelou’s poem “Phenomenal Woman,” I embrace femininity beyond the boundaries of time, place or culture. Drawing viewers into the landscapes – with their geometric patterns, the play of light and shadow and glimmers of something beyond – one is captivated by the remains of an extraordinary presence. Also exhibiting in a concurrent solo show: HOLLY ELANDER.